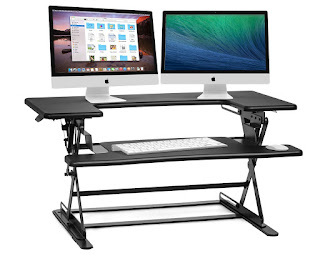 Today ONLY - this Adjustable Desk Sit to Stand Elevating Desktop Workstation $119.99 (Retail $169.99). ⭐ HEIGHT ADJUSTABLE: Make Working Comfortable Without Height Adjustable ED-600, Gently Squeeze The Handles For Easy Height Adjustment From Sit ⬇ To Stand ⬆ Position. ⭐ FULLY ASSEMBLED: Seamlessly Setup Your Fully Assembled ED-600 By Placing It On Your Table, Desk Etc. And You're All Set. ⭐ FREE UP SPACE: Our ED-600 Tabletop Comes With A Large, Sturdy Platform With More Than Enough Room For Your Office Essentials Such As A Laptop 💻, Full Size Keyboard ⌨, Mouse, Accessories &amp; Much More. ⭐ RELIABLE MECHANISM: Our Tabletop Offers State Of The Art Gas Spring Technology Exclusively Patented By Halter. ⭐⭐⭐⭐⭐ We, at Halter, Offer Not Only Top Grade-A Quality Products But Also Provide Top of The Line Customer Service Along With Our 1-Year No Questions Asked Warranty Policy Which You Won't Get With Other Brands.